En son Margotbean en 2019-04-06 20:51:31 tarihinde düzenlenmiştir. Sam is a villager who lives in Pelican Town. He's one of the twelve characters available to marry. He lives in the southern part of town, just north of the river at 1 Willow Lane. Sam is an outgoing and energetic young man with a passion for music. He works part-time at JojaMart. Sam can often be found practicing his guitar in his bedroom. He's also frequently seen outside of his house playing a handheld video game, or attempting skateboard tricks. On weekends he can be found playing pool at The Stardrop Saloon. He works part-time on Monday and Wednesday at JojaMart (if it is in business), or at the Museum in the Artifacts and Minerals display (if the Community Center has been restored). He frequents the Stardrop Saloon during spring, goes to the beach during summer, and visits the woods west of town in the fall. When it's raining he'll often stay home all day, or visit the Stardrop Saloon for a few hours. On the 11th of Fall, he has an appointment at the clinic. 10:00 AM Wakes up and stands in the middle of his bedroom. 11:00 AM Leaves his bedroom and walks to JojaMart. 12:50 PM Arrives at JojaMart and starts work. 4:00 PM Finshes work at JojaMart and walks home. 6:00 PM Arrives in his bedroom and stands in front of his bookshelf. 10:40 AM Plays his guitar in his bedroom. 2:00 PM Leaves house and stands near Mayor's Manor by the river. 6:30: PM Heads back home. 10:00 AM Wakes up and stands in front of his dresser. 10:40 AM Plays guitar inside his bedroom. 1:40 PM Leaves his bedroom and walks to the bush southeast of Lewis' house. 3.00 PM Stands in front of the bush to the southeast of Lewis' house. 6:30 PM Starts walking home. 7.50 PM Arrives in his bedroom and stands in front of his desk. 9:00 PM Goes to bed. 10:00 AM Wakes up and plays guitar inside his bedroom. 11:00 AM Leaves his bedroom and skateboards outside of his house. 3:00 PM Walks to the Stardrop Saloon. 4.00 PM Arrives at the Stardrop Saloon and plays pool near the arcade. 9:20 PM Leaves the Stardrop Saloon and walks home. 10.20 PM Arrives at home. 10:00 AM Wakes up for the day, moves around his room. 1:40 PM Leaves the his bedroom walks into town and stands near Lewis's house by the river. 6:30 PM Returns home from town. 9:00 PM Goes into his bedroom to go to bed. 9:00 AM Wakes up and stands in front of his dresser. 11:00 AM Leaves his bedroom and walks to the bridge near the Museum. 12:00 PM Arrives at the bridge near the Museum. 4:00 PM Leaves the bridge near the Museum and walks to the tree in front of Emily and Haley's house. 4.40 PM Arrives at the tree outside Emily and Haley's house and plays his handheld video game. 7:30 PM Arrives in his bedroom and stands in front of his bookshelf. 11:00 AM Plays guitar inside his bedroom. 1:40 PM Leaves his bedroom and walks to the beach by the firepit with his brother Vincent. 7:00 PM Returns home from the beach. 11:00 AM Leaves his bedroom and heads to JojaMart with his mother Jodi. 12:50 PM Arrives at JojaMart. 4:00 PM Leaves JojaMart and heads back home. 5:50 PM Arrives home, moves around his bedroom. 11:00 AM Starts playing his guitar in his room. 3.00 PM Leaves bedroom, stands in kitchen and plays his handheld video game. 5:00 PM Heads back to his bedroom, moves around. 8:00 PM Goes to bed. 1:20 PM Leaves the his bedroom walks to The Forest southwest of Leah's Cottage. 7:00 PM Returns home from The Forest. 10:00 AM Wakes up for the day inside his bedroom. "I gotta go visit Uncle Doctor today... Great." 11:30 AM Walks to the clinic for his annual checkup, plays his handheld video game in the waiting room. 1:30 PM Gets medical checkup at the clinic. "I'm a healthy boy, doc. Can I go now? This is boring." 4:00 PM Leaves the clinic to walk into town. "I just got out of the doctor's office. Completely healthy and vigorous, just as I expected." 9:00 PM Returns to his bedroom to go to bed. 1:20 PM Leaves the his bedroom walks to the Stardrop Saloon. 7:00 PM Returns home from the Stardrop Saloon. 9:00 AM Wakes up for the day, moves around his room. 11:00 AM Leaves the his bedroom walks into town. 4:00 PM Continues to walk around town, plays his handheld video game. 7:00 PM Returns home from town. 9:30 PM Goes into his bedroom to go to bed. 10:00 AM Wakes up for the day, stands in front of the dresser in his room. 11:00 AM Plays guitar inside his room. 3:00 PM Plays his handheld video game in the kitchen inside his house. 5:00 PM Returns to his bedroom. and stands in front of his dresser. 6:30 PM At his desk inside his bedroom. 8:00 PM Goes to go to bed. 11:00 AM Moves around inside his home. 2:00 PM Leaves the his bedroom walks to The Stardrop Saloon. 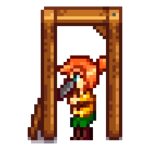 "Nothing like an ice cold Joja Cola on a sopping wet day, huh? Just kidding. Hehehe." 7:40 PM Leaves The Stardrop Saloon and returns to his bedroom to go to bed. 8:00 AM Wakes up for the day inside his bedroom and walks just outside to stand by the river in front of Haley and Emily's house. 11:00 AM Walks to a nearby bush and plays his handheld video game in town. 12:30 PM Leaves town, goes to his bedroom with Sebastian to practice guitar. 3:00 PM Hangs out in his room with Sebastian. 6:00 PM Leaves his home to walk to the river in front of his house with Sebastian. 7:40 PM Returns to his bedroom to go to bed. 10:00 AM Wakes up for the day inside his bedroom. 11:00 AM Leaves the his bedroom walks to the Museum. 4:00 PM Leaves the Museum, and heads home. 6:00 PM Arrives home, stands in his bedroom in front of bookshelf. 9:30 PM In his bedroom in bed. 10:00 AM Wakes up for the day, plays guitar inside his bedroom. 11:00 AM Leaves his bedroom and walks into town to go skateboarding. 3:00 PM Walks to The Stardrop Saloon to play pool near the arcade. 9:20 PM Leaves the Stardrop Saloon and walks home to his bedroom to go to bed. If the community center is restored, Sam doesn't leave The Farm except on Monday and Friday. On Saturday mornings he spends time doing skateboard tricks on the half-pipe behind the farmhouse. 8:00 AM Leaves home and heads for Pelican Town. 9:30 AM Arrives at 1 Willow Lane and stands in the kitchen. 11:00 AM Moves to living room. 3:00 PM Leaves 1 Willow Lane to return home. 4:00 PM Arrives at the farmhouse. 11:50 AM Skateboarding south of the Stardrop Saloon, by the benches. 3:00 PM Heads into the Stardrop Saloon. 3:30 PM Playing pool in the Stardrop Saloon. 9:00 PM Leaves the Saloon to return home. 11:00 PM Arrives at the farmhouse. Sam lives with his mother Jodi and younger brother Vincent. His mother spoils both of them, and claims that neither have ever had to do any chores. He is close to Vincent, and feels responsible for him in his dad's absence. In Spring, Year 2, Sam's father Kent returns and resides in the house with the rest of the family. After marriage, Sam will visit his family regularly to check up on them. Sebastian and Abigail are his bandmates and close friends, and they often spend time together. When they are hanging out at The Stardrop Saloon, Sebastian is always seen beating Sam at pool, while Abigail watches from the couch. He is also friends with Penny, and will dance with her at the Flower Dance if neither is dancing with the player. You can give Sam up to two gifts per week (plus one on his birthday), which will raise or lower his friendship with you. Gifts on his birthday (Yaz 17) will have 8× effect and show a unique dialogue. Enter Sam's house when he's there. Sam and Sebastian are jamming out in Sam's room. Sam tells you he's trying to get a band together, but he's unsure what style of music to play. He asks what music you like. No matter which style you pick, Sam says that's the style he's been thinking about for the band. He asks Sebastian if he's on board too. Sebastian agrees and Sam thanks you. In any season except winter, enter the beach on a sunny day between 7am and 3pm. This event only happens in Year 1. Sam is watching his brother Vincent play in the sand. Sam says his dad used to take them to the beach on sunny days. Vincent asks if their father will come home. Sam says "Of course". Vincent mentions overhearing people talk about mass military casualties. Sam tells him not to believe them, and Vincent returns to playing. Sam feels bad for getting his brother's hopes up and asks for your opinion. "It's best to be honest with kids." (arkadaşlık etkisi yok) Sam questions your thoughts, but then agrees that kids have to learn about the world one way or another. "You did the right thing. Kids should have hope." (arkadaşlık etkisi yok) Sam agrees and says kids should hang on to their childhood as long as they can. Sam tells you the band's coming together, and Sebastian really wanted Abigail to be the drummer "for some reason". Sam is in the kitchen. He says hello. As he's getting you a snack, he drops an egg on the kitchen floor. His mom hears the commotion, walks into the kitchen, and becomes upset about the mess. Sam asks you to tell her what happened. "Sam handed me the snack and then I dropped it." (+50 arkadaşlık) Sam agrees with you. Jodi thanks you for being honest, and Sam insists he'll clean up the mess. On any day when it's not raining, enter the town between noon and 4pm. Sam is skateboarding and grinding on Emily and Haley's flower box. Lewis catches him and scolds him for it. Sam asks for your opinion. "You're right, sir. Sam should respect private property." (arkadaşlık etkisi yok) Sam is unhappy, but obliges and says he'll just not skateboard ever again. "Don't blame Sam. There's nowhere else to ride!" (arkadaşlık etkisi yok) Sam seems happy and agrees. Mayor Lewis becomes frustrated and states that he thought you were more mature than that but afterwards apologizes to Sam and asks him to be more careful in the future. "I'm staying out of this." (arkadaşlık etkisi yok) Mayor Lewis says he doesn't want to see Sam doing it again, Sam agrees and the Mayor leaves. Then Sam turns to you and, with a smile, asks if you saw his rad trick. Sam shows up at your doorstop between 6am and 8am. Only triggers if you've seen his two-heart event. Sam invites you to see his band play in the city and asks to meet at the bus stop at 4pm. Enter the Bus Stop screen between 4PM and 7PM to meet Sam and the others, and watch them play. He thanks you for inspiring his band with the type of music they should play. After receiving a letter from Sam, enter the town on a sunny day between 8pm and midnight. You meet Sam outside his house. He says it's cold outside and sneaks you into his room to talk privately. As he admits he's falling for you, his mom knocks on the door. He has you hide in the bed. His mom comes in and asks why he's sweating and red in the face, and Sam says he's just been doing push ups. She wishes him good night and leaves. Move Closer. (arkadaşlık etkisi yok) You return Sam's affections, and the two of you share a kiss. Head for the window. (arkadaşlık etkisi yok) You reject Sam's advances. Stay put. (arkadaşlık etkisi yok) Sam crawls into bed with you, kisses you, and says "I knew there was something special between us." Once married, Sam will move into the farmhouse. Like other marriage candidates, he will add his own room to the right of the bedroom. He'll also set up a half-pipe behind the farmhouse where he'll sometimes go to practice his skateboarding tricks. On rainy days, Sam may offer you a gift that he found "rolling around in the back of a drawer": Cactus Fruit, Coconut, Earth Crystal, or Geode. On rainy nights, he may offer you Pizza. On nights when Sam stays inside the farmhouse all day, he may offer you instant Pancakes, explaining that he never learned to cook. Sam may randomly request an item at the "Help Wanted" board outside Pierre's General Store. The reward is 3x the item's base value and 150 Friendship points. Sam's look evolved over the years the game was in development. Here's a timeline showing how ConcernedApe's art and Sam's style changed over the years before the game was launched. Sam is allergic to pollen, which he mentions during the Egg Festival. He also mentions that his "nose is really happy" during summer due to the typically lower pollen count. "Sam" is short for "Samson", which he reveals to the player once they have a good relationship with him. He also states that he doesn't want the player to tell anyone. "Sam" is a unisex given name of Hebrew origin, meaning "God has heard". Other meanings are "Sun child" or "bright sun". Sam's dialogue is less harsh than other NPCs when the player rummages through garbage cans. Instead of being disgusted, he just asks the player why they're searching through the trash. It still costs the player 25 friendship points, however. 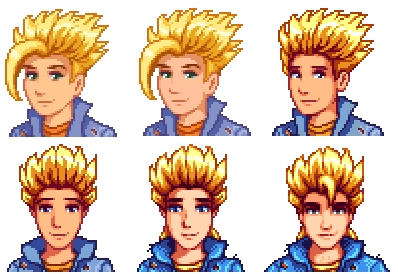 On Sam's portraits, his undershirt is yellow, but in his sprite, it is red. Sam's Old Guitar is a weapon in the game, but is currently unobtainable. Sam used to live in Zuzu City. He recalls how bright and loud it is day and night, and how hot it is during summer. Bu sayfa son olarak 6 Nisan 2019, 20:51 tarihinde güncellenmiştir.